This is the third installment in a multi-part series looking back at the victory over the Midtown bike ban, 25 years ago. 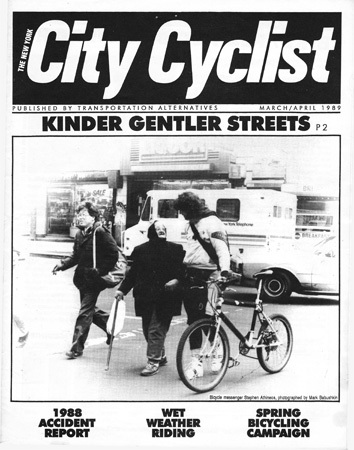 Read parts one and two for an overview of the bike ban and the advocacy of the 1970s and 80s. Activists are planning a September 28 bike ride and forum to commemorate and celebrate the events of 1987, and Streetsblog readers are invited to participate and contribute. Bike messenger Steve Athineos and an older acquaintance pose on Seventh Avenue to get the message out about pedestrian-cyclist unity. Then, as now, not every collision between a pedestrian and a bicyclist was reported to the police, and not every problematic bike-ped “interaction” was a collision — some were frightening near-misses. But for much of the 1980s and 1990s, bike-ped collisions reported to the NYPD were collated into monthly citywide counts. The monthly and annual crash totals began falling in 1987, around the time of the bike ban protests, and they continued dropping, each year to the next, into the 1990s. The reported number of collisions between bicycles and pedestrians peaked in 1986, at 631 citywide for the year. The crash figure for 1987 was around one hundred less, and the 1988 figure a hundred less than that. By 1992, only 298 bike-ped collisions were reported, less than half the number in 1986. 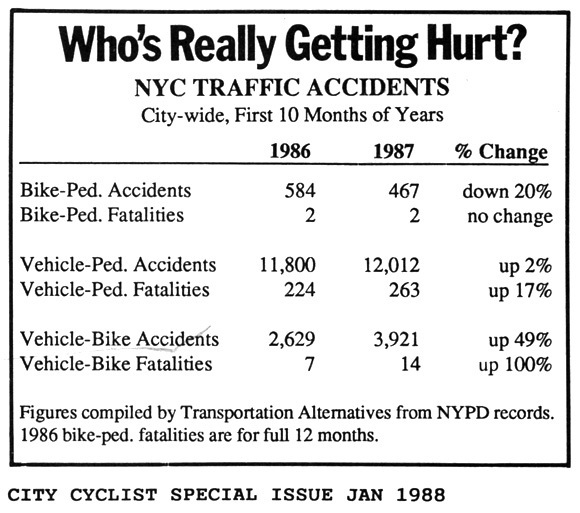 Why did reported bike-pedestrian collisions begin falling in 1987, around the time of the proposed bike ban? A cynic would say that pedestrians simply gave up reporting these incidents, or that the cops were cooking the books (though in the “wrong,” i.e. downward, direction). A more plausible as well as satisfying explanation is that pedestrians and bicycle riders began to mutually adapt — a process that was abetted by the bike ban protests. Through the animated demonstrations and supportive media coverage, messengers and other cyclists emerged as actual and sometimes sympathetic human beings who deserved to exist — and to be looked out for when crossing the street. For their part, cyclists felt empowered from seeing their stories told in the papers and from experiencing, if only for a few hours a week, the city’s avenues as “our streets.” Over months and even years, the ethos of pedestrian solidarity that suffused the protest rides and was codified in Transportation Alternatives’ safety leaflet — originally composed for the lemonade stands and now handed out by the thousands — came to permeate the city’s bike culture and to counter-balance the brutish state of the streets. By the spring of 1988 the bike ban was dead. Whether it was done in by the drop in bicycle-pedestrian crashes, the promise of renewed protest rides, or cycling’s newfound stature, bike advocates no longer had to look over their shoulder at City Hall. At least as importantly, cyclists had ceased to be everyone’s favorite whipping boy. For the first time in years, you could speak up for cycling at a public forum and not be hooted down. And the 1987 uprising was generating resources for Transportation Alternatives: rising membership, a cadre of volunteers, and enough funds to hire as director — the first full-time staff in a decade — an energetic and passionate economics grad student named Jon Orcutt. Having defeated the ban, TA and the larger NYC cycling community were ready to change what we called “the equation on the streets” from one that was massively stacked in favor of cars to one that was ecumenical and democratic. Comprehensive crash stats in City Cyclist gave the lie to the "bicycle menace" canard. That I found myself helping to drive this movement, as president of TA’s volunteer board, was largely accidental, if not downright bizarre. I had been a foot-soldier in anti-Vietnam War protests but had zero organizing experience. I had joined TA in the mid-seventies and dabbled in bike activism, only to immerse myself professionally in national energy policy work that was worlds apart from city streets. I was a wilderness hiker (on the day the Midtown bike ban was announced, I was summiting a peak in the Cascade Range, blissfully oblivious to the goings-on at City Hall) but had waited till my mid-twenties to learn to ride a bike. I was recruited by Carl Hultberg, a Green activist with one foot in utopian movements and the other in TA. Carl, like myself, couldn’t abide the scapegoating of cyclists for the city’s traffic ills and longed to unite cyclists and pedestrians to take back the streets from cars. When I got his postcard invitation to an exploratory meeting, I was smarting from a humiliating encounter with a bus driver who had come within inches of punching me out after I cursed him for pinning me to the curb. I was also hungry for a new challenge and possessed by a vision. Even before I learned to ride a bike in 1973 — maybe the reason I overcame my embarrassment and finally did it — I had read and absorbed Paul Goodman (“Banning Private Cars from Manhattan” and “People or Personnel”) and Ivan Illich (“Energy and Equity”) and David Gurin’s Village Voice dispatches heralding cyclists as the cutting edge of urban sustainability. These 1960s and 1970s ideals had rattled inside my head for a decade or more. Now I was ready to devote myself to them. It was my and every other velorutionary’s good fortune that the Midtown bike ban came along when it did. Organizing which would have required years got telescoped into months or weeks. People who hadn’t taken to the streets in ages (or ever) discovered how uplifting it can be. Bicycle advocacy moved from abstraction to necessity. Next week: The victories of 1988-1990. Knowing Charlie is never less than straight-forward honest, it’s still hard to believe, as he writes, that he had no organizing experience before TA. Reaffirming knowledge, however come by, is always useful. While the upcoming Battle of the Bike Ban Uprising Reunion in The Great Hall at Cooper Union is further proof how much Mr. Komanoff cares. Of course on the day the Midtown bike ban was announced, he was summiting a peak, blissfully oblivious to the goings-on at City Hall he came down from a mountaintop to face. I answered my bike courier company owner’s challenge to work because he’d lose business with no one to cover the pick-ups and deliveries if everyone was at the demonstrations. Then in the evenings, this Florida transplant, rode that ole horrendously dilapidated Williamsburg Bridge to the loft of the artist Dragan to work on our documentary he shot during the day that’s scheduled to be shown September 28th. And something I’m most proud of is the script was written sitting on the indoor steps of the Madison Avenue entrance to 42nd Street’s Lincoln Building. So satirically speaking, we’re all doing our best to correct a mistake of history – that Abraham, who certainly deserved to, never got to ride a bike. one of my favorite T.A. photos of all time.